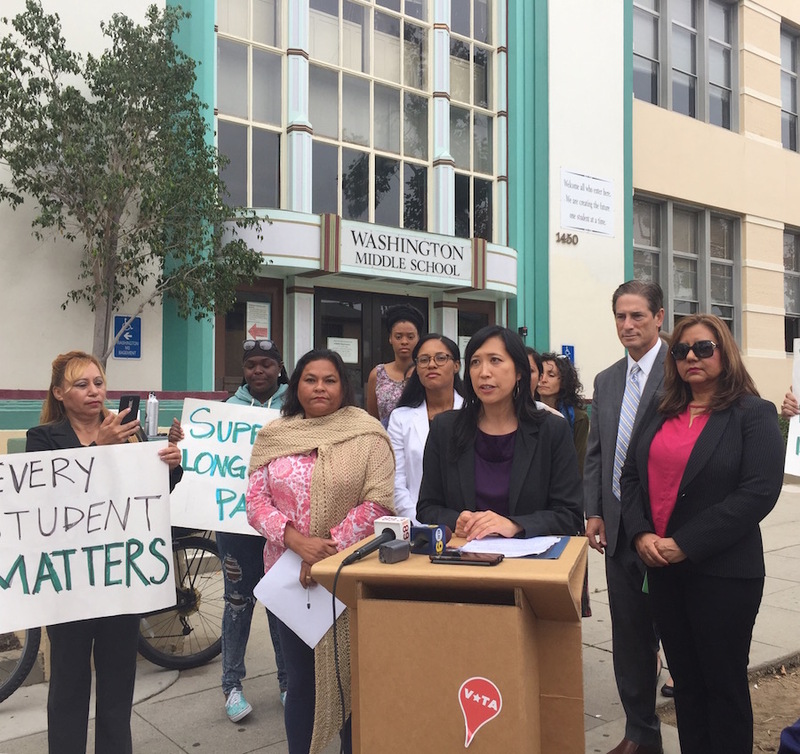 Public Advocates senior attorney Angelica Jongco and residents announcing their appeal to the California Department of Education outside Washington Middle School last August. File photo by Jason Ruiz. A settlement has been reached between Long Beach Unified School District (LBUSD) and parents and community groups who filed a complaint last April alleging the school district misallocated funds earmarked for high-needs students. The agreement was announced today in a joint press release from LBUSD and the community groups. The complaint was filed by Public Advocates Inc., a non-profit advocacy group, on behalf of the Children’s Defense Fund, Latinos in Action and two parents of low-income, English-learner students, Guadalupe Luna and Marina Roman Sanchez, listed as the main complainants. The agreement details the types of services that will be expanded for high-needs students over the next three years, including enhanced mental health and social emotional services and extended tutoring in math and English to 30 of the district’s highest-need schools. The school district will also implement a high school readiness pilot program at Washington, Franklin, and Hamilton Middle schools to provide counseling, mentorship and support for these students, according to the release. It will also support improved community engagement in developing the Local Control and Accountability Plan (LCAP), including fall and spring community forums co-hosted with complaintaints, as well as improved sharing of information about the LCAP. Sanchez noted this agreement marks the beginning for all families who need help in receiving appropriate services. Sanchez previously said her autistic son was arrested when he attended Long Beach Polytechnic High School for behavioral issues and that it took a lawyer to get him transferred to Millikan where he was able to find the services that helped him graduate. “We look forward to continuing to work with the district to address the needs of our students,” said Sanchez in a statement. The groups had alleged LBUSD inappropriately allocated funds intended for high needs students—defined as foster youth, low-income and English-learners under the law—by spending the dollars in a districtwide fashion. Under a California law enacted in 2013 school districts receive additional funding through the Local Control Funding Formula (LCFF) for students who are classified as disadvantaged or high needs. Every three years, the district passes a new budget known as the Local Control and Accountability Plan (LCAP) which outlines how these funds, and other sources of revenue, will be deployed to service students. The April 2017 complaint alleged that LBUSD spent $24 million of LCFF funds in its 2016-2019 LCAP outline. Of the $24 million, the district had allocated $17 million for textbooks and materials and $7 million in teacher salary costs. The district previously contended that because such a high number of its students—roughly 70 percent—fall into categories that would qualify for additional LCFF funds, that districtwide expenditures fall in line with the spirit of the law. The Los Angeles County Office of Education (LACOE)—which the groups also filed a complaint against last year—previously found that the district’s spending on textbooks could not be demonstrated to have targeted benefits and instructed LBUSD to discontinue claiming the totals for its LCAP going forward. The complaints have been pending on appeal before the California Department of Education.